The Trump administration has made a breathtaking and invasive demand to all 50 states demanding they turn over personal information on every individual registered voter in the country. The administration wants names, addresses, birth dates, political party affiliations, records of elections in which people have voted and the last four digits of people’s social security numbers. Colorado Secretary of State Wayne Williams, a Republican, plans to turn the information right over on July 16 without any argument. But there is one thing you can do to stop the Trump administration from getting your personal information: ask the Mesa County Clerk to make your voter information confidential. It’s easy to do, but you’ll have to be quick. Just print and fill out a Voter Record Confidentiality Request (pdf) and take it to the Mesa County Elections Office at 200 S. Spruce Street in downtown Grand Junction before close of business tomorrow, and pay $5.00. Trump won’t get your information, but there’s one caveat: Thereafter, if you need to change any of your voter information, like address or party affiliation, you’ll have to do it in person. 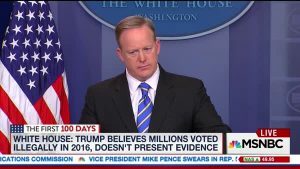 Just days after being sworn in as president, on January 27, 2017, Donald Trump tweeted without any evidence that “at least 3,000,000 votes were illegal” in the 2016 election. After the election, he also claimed that if all these fraudulent votes were subtracted, he would have won the popular vote as well. There is overwhelming evidence that voter fraud is a vanishingly rare phenomenon. Despite this, Trump claimed massive voter fraud was the reason Hillary Clinton won the popular vote. She got 48.2% to Trump’s 46.1%, according to the certified election results from all 50 states and the District of Columbia. Massive amounts of data show voter fraud is a myth, yet on May 11, Trump signed an executive order establishing a 15-member commission on “election integrity.” He is now is using this commission as a vehicle to collect personal information on every voter in the country. Keep the government from getting your private information. Hello, they read your emails! Read the form; (confidential request). The only thing you’re going to keep private is your address, forcing them no doubt to go all the way to the white pages in the phone book. Yeah, that’s the ticket. That’ll teach the bastards to meddle in your elections.